We are big lovers of lemons! Lemon water, lemon in juice, lemon bliss balls and especially raw lemon treats! 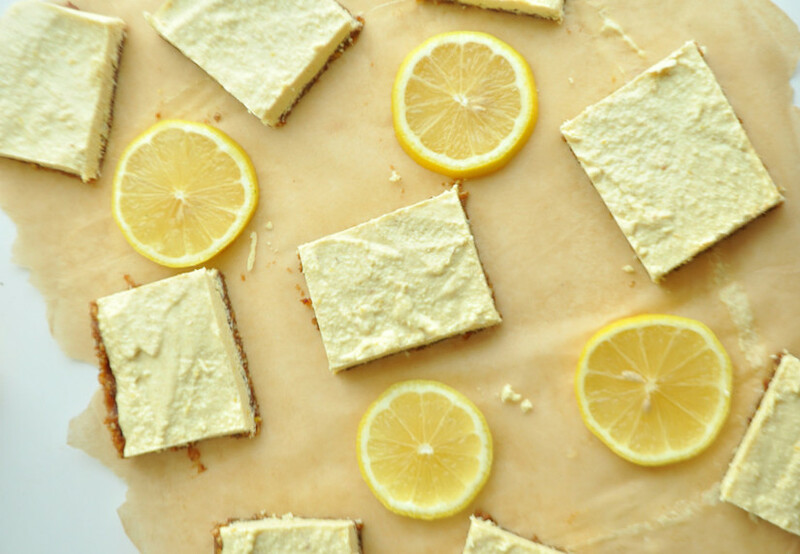 This raw lemon slice doesn’t not disappoint on the list of lemon loves, plus it is super easy to whip up. In a food processor, chop the dates, nuts, and salt until a dough-like consistency is formed. In a 8×8 pan lined with parchment paper, press the crust into the bottom in an even layer. Wet your hands slightly it is sticky. In a food processor or blender add the coconut flakes and process until smooth and creamy. To the coconut butter (that you just made or just buy coconut butter) add the rest of the ingredients and blend until smooth. Adjust sweetener as needed but remember the crust is sweet as well.